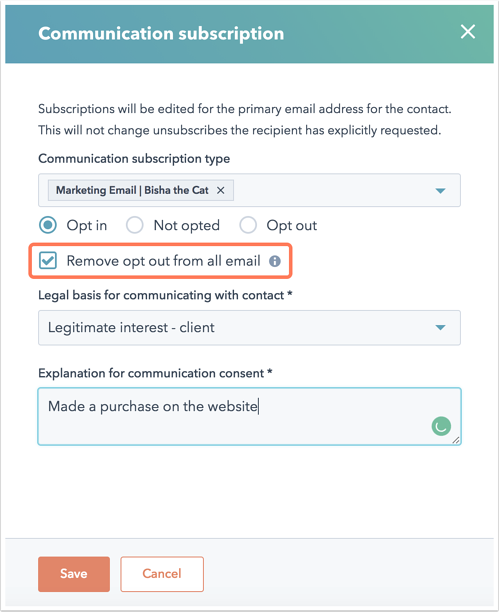 You can remove an opt-out of email status that was added manually by a user in your HubSpot account. This action can only be applied to contacts who were opted out manually from the contact record, through a workflow, or through an opt-out list. Please note: contacts who have unsubscribed from marketing emails sent from your HubSpot account can take action to resubscribe to your emails or update their email preferences. Select the checkbox(es) next to the record(s) you want to edit. Click the More dropdown menu, then select Edit communication subscription for contact. In the Communication subscription panel, select the Remove opt out from all email checkbox.